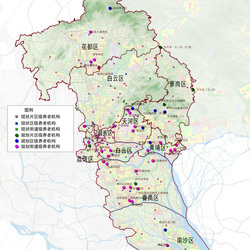 Guangzhou is going to choose 53 area (144 ha) to build new nursing homes so as to ease the pension problems. The number of old people will reach 1.75 million by 2020, which will account for 18.78% in the overall population in Guangzhou. The new nursing homes will be located at Haizhu, Tianhe, Baiyun, Huadu and Luogang Districts. They plan to add 8100 beds each year from 2014 to 2020. In the plan, the nursing homes should be near living facilities and residential areas as well as staying away from the facilities like gas and fire stations.